Bellmarc’s Sue Caplan says her biggest request from clients in 2004 wasn’t for a classic six or a terrace. Instead, she wrote in her December holiday letter, the most coveted “property” in New York was even more elusive: “Single male, 30s–40s, attractive, not overly neurotic, geographically desirable.” She was joking, but only a little. “I get a lot of clients who are actively looking for a mate, and they see me as a good source because I meet so many people,” Caplan says. Forget Match.com or JDate. If you’re a single New Yorker, your best bet may be to ask your broker to find you not just your dream apartment, but also someone to share it with. In fact, snagging you a date might prove easier in this overheated market. No wonder Andrea Picott, a 32-year-old Manhattan banker, is giving her real-estate agent, Vickey Barron of Douglas Elliman, a chance to pair her off at a company-sponsored “open house” for unattached clients around Valentine’s Day. “She’s always talking about how she wants to set me up, so why not?” reasons Picott. Singer, composer, and cabaret owner Michael Feinstein has finally unloaded his meticulously renovated two-bedroom condo at 15 West 63rd Street (a.k.a. the Park Laurel) for approximately $3.75 million. Sources say the cabaret crooner, who spends most of his time in Los Angeles but keeps a place in the city for his numerous East Coast stints, moved to an Upper East Side townhouse last summer to be closer to his eponymous nightclub at Park Avenue’s Regency Hotel. But it took a few months to find a purchaser for his former pied-à-terre. That (unidentified) buyer has just moved in, no doubt enjoying what Corcoran broker Haidee Granger, who lives in the building and represents many deals there, describes as an “immensely stylish space.” Neither Feinstein nor his broker, Lisa Calka, was available for comment. Brokers: Warren King and Toni Scott, Brown Harris Stevens. It’s hard to find a deal in a seller’s market, but this Tribeca condo is about as close as they come. Everyone on our panel thinks the three-bedroom, three-bath apartment is worth more than its asking price. Listings broker Warren King of Brown Harris Stevens explains that the owners are looking for a quick sale because the husband’s been transferred to Southern California. Marjorie Dybec, Bellmarc: “A lot of people looking in Tribeca really want a loft, and it may be hard to get a buyer to pay loft prices for this,” says Dybec. Still, she says, the apartment should “sell easily” because it’s in pristine condition, has a great layout, and is located in the coveted P.S. 234 school district. S. Hunie Kwon, JC De Niro and Associates: “It’s surprising because this is commonly known as a cookie-cutter building,” he says. 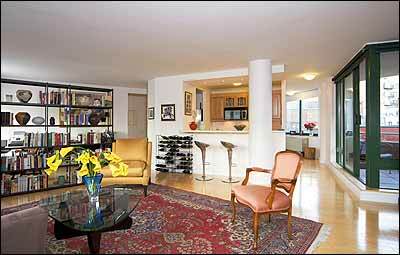 “But this unit has a unique layout,” with views of the Hudson from all three bedrooms.